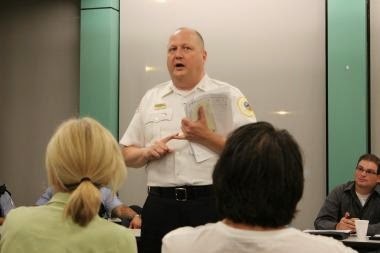 19th district Chicago Police Cmdr. Elias Voulgaris received a new assignment Friday as the department announced a series of executive-level changes. CWB first reported the changes Saturday evening on our Twitter feed. Voulgaris’ candor, accessibility, and sense of personal responsibility were a refreshing change for local residents who had seen a series of short-term, party-line commanders come and go in the years before his arrival. Voulgaris took steps to correct long-neglected problems that fueled a years-long spike in violent street crime around Wrigleyville and Boystown. By the time Voulgaris arrived in October 2012, manpower on the overnight shift in our nightlife-heavy district had atrophied to dangerously-low levels. He navigated the police department’s bureaucracy and gradually brought the midnight shift up to full strength in 2014. While the district’s overall manpower now sits at a record low, the critical overnight shift is fully staffed. Voulgaris also took on the neighborhood’s long-neglected robbery problem. After three consecutive years of record-high robbery rates in Wrigleyville and Boystown, muggings and hold-ups plunged 34% last year. They’re down another 10% this year. By fall, change was in the air, with Voulgaris telling a boisterous CAPS meeting that he would no longer make statistics the focus of our neighborhood meetings. "No one believes the stats." He called on service agencies to step up to their responsibilities. But, most importantly, he went a long, long way toward fixing serious problems that a series of previous “leaders” claimed did not exist. Monday, Voulgaris will report as commander of the department’s Bureau of Patrol and Capt. Robert Cesario of the detective division will arrive as acting commander in Town Hall. Cesario walks into a bit of a pickle, having to decide where to put the dwindling police force that he will command. Should he put them around the Major League Baseball stadium, nightlife robbery zone, and L stations? Helmont maybe? How about the Uptown "Gang Conflict Zone"—yes, Uptown readers, that's what the department calls your hood—where homicides and shootings are popping at a record pace? Such is life in an undermanned police department that can no longer handle two challenges at once. Talking with a couple of cops last night, both said Cesario's good and solid. We hope so. We’d like to believe that this neighborhood has moved beyond the company line.